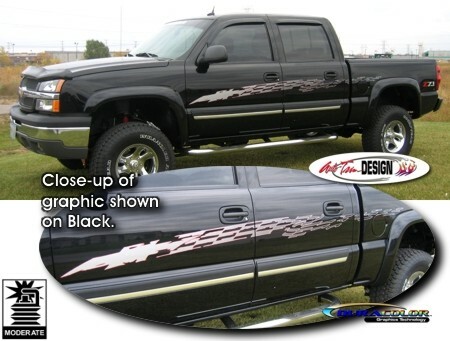 Dress up your Chevrolet Avalanche or Truck with these awesome Bowtie Checker Flag Graphics. Starting at the front, a broken-up graphic element flows into a waving Checker Flag design that completely breaks up to the rear. Graphic starts at the front in Silver Metallic and fades to Black while a fine Red and Silver Metallic faded outline enhances the whole design. Overall graphic measurements are as noted below. Kit is packaged with one (1) graphic for each side of the vehicle. Easy-to-follow general online installation instruction and care guide provided.